Some months ago, Tim Handley post with a huge box unofficially nicknamed as “OMG ATX” formfactor and certain sources revealed that to be a P67A-UD11. We had an interview with Tim Handley and one of our guys asked a question to tell us more about the much rumoured P67A-UD11 otherwise nicknamed as the OMG-ATX form factor other than what some people already know and BOY!!!! He said it in his own way: Dude, the cake is a lie!! You heard this one first from Hardware BBQ. Stay tuned for the complete interview video and the Gigabyte India conference videos planning to put up very soon. wow! Talk about a bad apple. 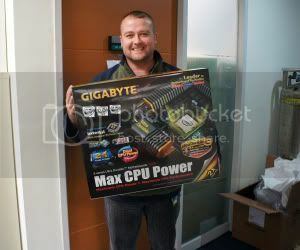 Still- Its barely going to cost anything for Gigabyte to make a board like this.